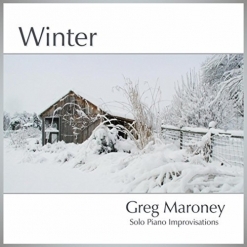 Greg Maroney’s Winter is the first in a series of four improvisational albums inspired by the seasons. These solo piano albums will be released throughout 2018 as the seasons come and go. I have been reviewing Maroney’s music since 2002 and am constantly amazed that he continues to take his music in new directions and becomes ever more expressive in his playing. His two Quiet Piano Improvisations albums blew me away, as has Winter. What is different about Winter is that several of the pieces on the new album are more powerful and dramatic rather than maintaining a relaxed mode throughout. The “bigger” sound of course contrasts some of the raging storms of rural Pennsylvania with the cozy warmth of being inside by a fireplace. I find it fascinating that all of these pieces were improvised late at night when there was “nothing but quiet and my Steinway grand piano.” Retiring from his longtime career as a trauma nurse a few years ago and acquiring his dream piano seem to have opened the floodgates of new music for Maroney. What a beautiful gift to the world or at least to anyone who will take the time to really listen! Winter opens with “Winter Gray,” my favorite piece on the album. By using a series of broken minor key chords and a simple melody, Maroney paints a vivid picture in black and white of trees and snow in the dead of winter. 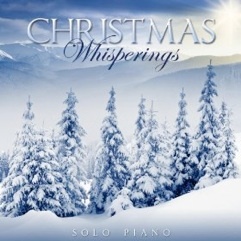 The music also expresses a bone-chilling cold and the peaceful quiet of falling snow. Greg doesn’t usually transcribe his improvisations for sheet music, but I sure hope he does this one! I think it’s one of his most beautiful pieces yet. “Grandmother’s Quilt” contrasts the chill of “Winter Gray” with the warmth and comfort (both physical and emotional) of snuggling in a quilt that has come down through the family. “January” is cool and reflective for the first half of the piece, becoming passionate and dramatic in the second half - another favorite. I also really love “Hearthfire” and the way it exudes the warmth and comfort of a fire in the fireplace on an especially cold night. This isn’t a crackling bonfire, but the gracefully dancing flames of a fire that has been burning for a while, warming the spirit as well as the toes. “Frosted Panes” has a haunting yet peaceful vibe that really grabs me. The melody is simple and bittersweet and the accompaniment is uncomplicated, but it expresses so much feeling as it creates a very cool, lonely atmosphere. Love it! “Northern Lights” is probably the most ambient piece on the album, flowing freely with grace and a full palette of tonal colors. “Pale Dawn” gently describes the tranquility of an early morning sunrise. Soft pastel tones become more vibrant as the piece progresses and brings this truly exceptional album to a close. 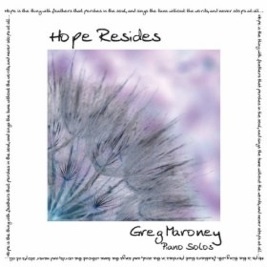 It seems that I conclude almost every review of Greg Maroney’s newest work by saying that it could be his best album to date. Well, I’m not trying to repeat myself, but I think Winter could be his best album yet. 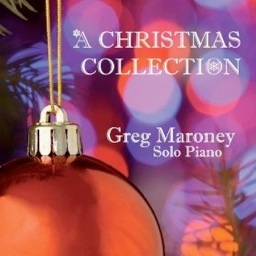 It is available for download from www.GregMaroney.com, Amazon, iTunes and CD Baby. I give it my highest recommendation!